Twenty-eight-year-old Mary Cook from south London was walking along Tooley Street, London Bridge, one evening when she collapsed and stopped breathing. She had suffered a cardiac arrest. 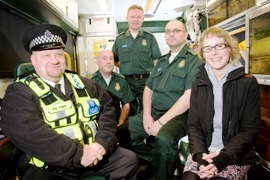 Waterloo ambulance crew paramedic Alan Hedger and emergency medical technician Paul Saddington, and single responder emergency medical technician Justin Langan arrived on the scene to find Noel administering CPR. Paul said: “Noel was giving CPR to Mary for about five minutes before our arrival, which effectively keeps a patient alive while advanced medical assistance is on the way. Alan and Paul took Mary to St Thomas Hospital where she underwent a bypass operation. After eight weeks Mary was discharged home. She is now back working as a web designer and is moving abroad to continue her career in Germany this month.